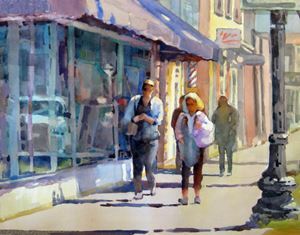 Many thanks to Shirley Jenkins, the Baltimore Watercolor Society and staff of Howard County Arts Council for the honor of jurying this wonderful show. All of these water media paintings have strong qualities. As I studied the methods, composition, value patterns, original concepts, it seemed that most pieces were completed with authenticity, many conceived from the heart. An impressive array of styles and approaches made it a pleasure to spend time with these paintings. Some are very well done, but do not represent the Value of Three theme clearly and therefore could not be awarded. The paintings that speak to me are not just replicas of photographs. 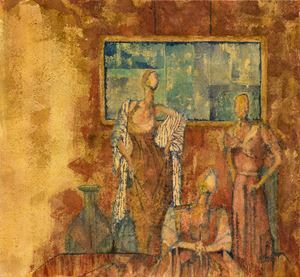 Unique subject presentation is striking with experimental texture and strong value shapes such as Jack Harding’s Mesa Verde and Marilyn Le May Patterson’s Ladies Three. Stephanie Lyon’s Sarah Times Three has strong, expressive movement. 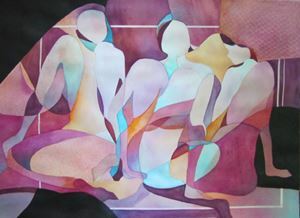 Deb Cohan’s Alone Together has a special transparent clarity with beautiful light, color and decisive shapes. Wanda Hurt’s Fantasy Trees is compelling, intimate and refreshingly creative. 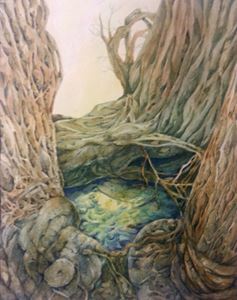 Lois Wolford’s Trey Missions has strength and feeling in composition and painting technique. I encourage you all to continue to be innovative, original in your subject matter and approach, to create with determination what is meaningful to you in a free way and to strive for inventive excellence.